I have not ever made a citrus curd (lemon curd) before but I LOVE lemons so I knew this would make a good filling for layer cakes and on top of pound cakes and pancakes (and lets be honest, its good just by the spoonful). 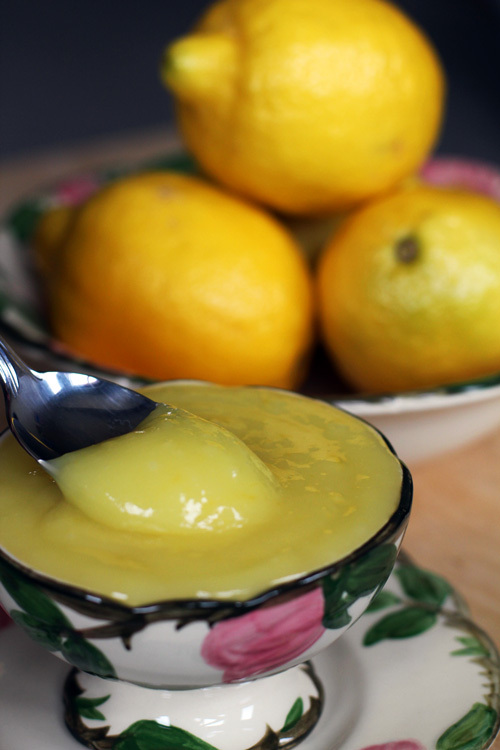 If you have lemons to use make this lemon curd and stick it in the freezer to keep on hand. It won’t freeze solid so it is practically always ready when you are. Fill the bottom pan of your double broiler with 1 inch of water and bring to a simmer. I use a small sauce pan and fit a glass measuring cup inside to makeshift a double broiler. In the top bowl of your double broiler whisk together eggs, yolks, sugar, and lemon juice. Place butter in but do not yet stir. Place top of double broiler over the bottom with the simmering water. Let mixture warm until the butter is melted stirring occasionally. After the butter is melted you will need to stir continually for about 15 minutes until the curd has thickened. You will know it is thick enough if when you remove the spoon, it is coated with lemon curd. Remove from heat and gently stir in lemon zest. Refrigerate for 3 hours before using.